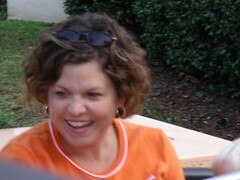 I want to apologize to all of you who have faithfully visited the site for updates on Patty and our family. Not posting is a good thing because that means that for the most part things are going well. Not posting also is a bad thing because it means I don't have the time to post. I love to write but this year my work has zapped every ounce of energy outside my allotment for my family that I have thus I can't find the time or energy to post. It's been an exciting summer. We've been camping 5 times anywhere from Maggie Valley to Grandfather Mountain. We went to Disney World in early June. A belated gift for Patty that I had wanted to give her in December when she finished completely all of her treatments. Grant started kindergarten this year so we now have 3 in school and Patty just has Brett at home. It looks like Patty is going to have a couple of follow-up surgeries this fall or winter. We're not sure yet when it will happen as we're waiting on some insurance issues. She is still have moderate issues with her lymphedema and her feet are really painful when she gets up from sitting or lying down. Both side effects from the breast cancer treatments. I'm hoping to return to Haiti the week after Thanksgiving to serve at the girls orphanage our church now takes care of. I hope to be posting more in the coming weeks and months.